It was the darkest times in China, when ruthless warlords waged battles to satiate their endless aggression. Millions of lives were perished, and those who survived had only two choices - To kill or be killed. The battalions of warring states Liang and Wei collided in a bloodbath that lasted from dawn till dusk. Only two men were left standing - A FOOT SOLDIER from Liang (Jackie Chan) and the rival GENERAL from Wei (Wang Leehom). The soldier could survive because he's an expert in playing dead, with a device strapped on his body that could protrude an arrowhead for added realism. The Soldier captured the wounded General, hoping to use the enemy as his exit - By handing the General to the Liang warlord, the Soldier could be honorably discharged and returned home to his peaceful life. The young General, though taken captive, was always condescending towards the Soldier. The two men were often at loggerheads during the long and winding journey. Along the way, they encountered a mesmerizing but scheming songstress, who drugged the duo and stole the General's jade medallion, the only evidence of General's identity. In the course of pursuit, they became entangled with a cohort of refugees who robbed all their food and water. To make their life even more complicated, they were stalked by a ferocious bear. The odd couple was forced to collaborate in order to survive one crisis after another. Unbeknownst to them, Prince Wen, the General's brother, was hot on their trails with his elite troops. What appeared to be a rescue mission turned unexpectedly into an assassination, with the prince desperate to secure his rung to the throne. At the end of the incredible journey, the hatred between Soldier and General was gradually replaced by camaraderie. A moral dilemma dawned on the Soldier - Which was more important in life, the General's friendship or the ticket to home? 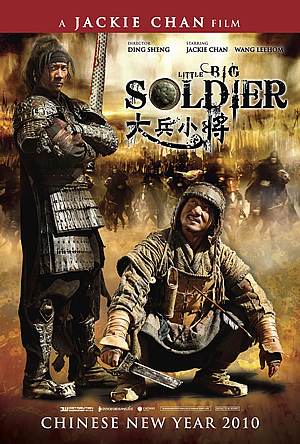 Based on a story conceived by Jackie Chan (JC) and scripted/directed by Mainland director Ding Sheng (The Underdog Knight), Little Big Soldier heralds another great departure from the usual Jackie Chan’s flicks we have seen over the years. So if you are expecting another one of Chan’s action comedies then Little Big Soldier or LBS for short will surprised you. The mega action star plays a drafted foot soldier from Liang whose only wish is for the war between Liang and Wei to end so that he can be discharged and go home. The foot soldier is definitely no warrior and the only way he came out of the war unscathed is he has the ability to play dead better than a possum. Incidentally, he managed to capture the General of Wei (Wang Lee Hom) who is also the Prince of Wei by the way. Hoping to get a reward from the Emperor of Liang and retire comfortably as a farmer, the foot soldier decides to drag the injured General back to his country and along the way met with resistance from bandits and Prince Wen (Steve Yoon, a Korean pop star for the uninitiated), the younger sibling of the General who is out to kill him to usurp the father’s throne and assumed Emperor. 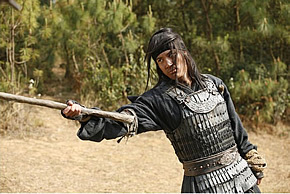 Even if the story is set in the warring times of Liang, Wei and Qin, JC and Ding Sheng is not interested to tell the struggles and battles between the countless warfare, unlike John Woo’s magnificent Red Cliff saga or Daniel Lee’s Three Kingdoms, LBS is more subtly confined to a 'smaller' story arc and concentrates heavily on the relationship between two men, one from each side of the tussle. Indeed, it takes a while for the movie to build up the momentum despite some heartening exchanges between the General and foot soldier and a scary episode involving a bear. If you are familiar with the Chinese’s quirky humour as seen in past Feng Xiaogang’s movies or Ding Hao’s Crazy Stone, you know Ding Sheng is definitely not one filmmaker who will resort to slapstick or cheap laughs or even 'mo-lei-tau' humour just to please the audience but right here, his script blends perfectly well into JC’s usual Buster Keaton inspired gags notably Jackie’s character who always has a slew of possum tricks up his sleeve and a funny appearance from Wang Baoqiang as a captured scout, it’s a true cultural exchange for the HK and Mainland filmmakers. Seriously for a 95 minutes movie, the recurring theme of 'going home' for JC’s character gets a bit tiresome after a while though, ironically this is the gist of LBS. The novelty starts to wear off within an hour and it seems the only way to sustain the story is to introduce a bunch of bandits to spice up the story a little. Precisely this is where LBS start to wobble. The characterization of the weak yet ambitious Prince Wen is largely ignored, sure it’s the Emperor throne he is after but it’s hard to know further other than these minor details and the bunch of colourful bandits as mentioned earlier sad to say is in purely for the action sequences. With LBS, Jackie finally showcases himself as a credible actor. He is no longer the supercop or hero as we known him for decades. In the role of the foot soldier, JC quietly submerged into a character that survives on his street-smart ways, nimble acts rather than kung fu chops. He is no longer the aggressive dragon as seen in Drunken Master or Dragon Lord that engages in prolonged fights with his opponents. 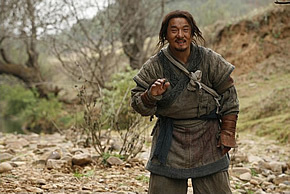 Here he is portraying an ordinary man who longed for a peaceful life back in his country than facing confrontation and I must say, he fares much better here than being over-sentimental (see The Myth), over-emotional (see New Police Story) or over-dramatic (see Shinjuku Incident) in his recent cinematic outings. Talented pop singer Wong Lee Hom (almost unrecognizable under all the grim and dirt) performance as the General is at best passable. Perhaps the years of carving his skills in music videos did help in his acting range. Then again, the role of the General doesn’t require that much emotion or expressions for that matter, same goes to Steve Yoon’s whose halting Mandarin serves up quite a bit of distraction in addition. Newcomer Lin Peng on the other hand plays a songstress whose family is tragically killed in the war and again her character is disposable and generates frequent unintentional laughter instead. As we can expect from a JC’s Asian production, the technical aspects are almost flawless. Majority of the crew which handled the costume, set designs and visual effects originates from China and LBS proved once again the Chinese talents should not be overlooked. The lensing from cinematographer Zhao Xiao Ding (The House of Flying Daggers, Curse of the Golden Flowers) is marvelous to ogle at. Every frame is nicely pictured and the beauty of each shot is undeniable. Little Big Soldier is definitely a far cry from the usual crop of Jackie Chan’s movies. It’s not a traditional crowd-pleaser for sure. It’s a JC movie with a bit of laugh and adventure, makes you ponder a little and closed with a grandeur poetic end. Thus the impatient crowd and those expecting high octane combat sparring and battle sequences are advised to avoid signing up for Little Big Soldier.